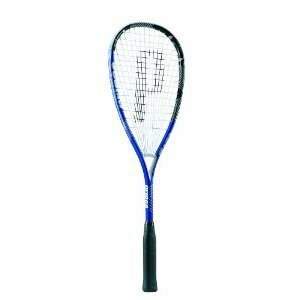 The Prince PR Storm Squash Racket utilises a high quality Graphite construction helping you to create your own luck on court with solid dependable performance that will allow for power, precision and stability.This racket utilises the innovative Power Ring which is an inverted "ring" in the throat of the racket that creates longer main strings for enhanced power, response and consistency.Triple Threat with Tungsten places titanium, copper, carbon and tungsten at 10 o'clock , 2 o'clock and at the bottom of the handle. This creates dependable stability whilst contributing further to increasing the sweetspot. The Power Ring Storm is the perfect racquet for beginners and intermediate players to improve consistency and power in their strokes. This racquet provides benefits every player strives for. Innovative and patented racquet design where all main strings wrap around an inverted ring. This provides longer, more uniform string lengths for more consistent response and greater power in a more durable frame.